Michelle Obama in India: Fashion Faux Pas? 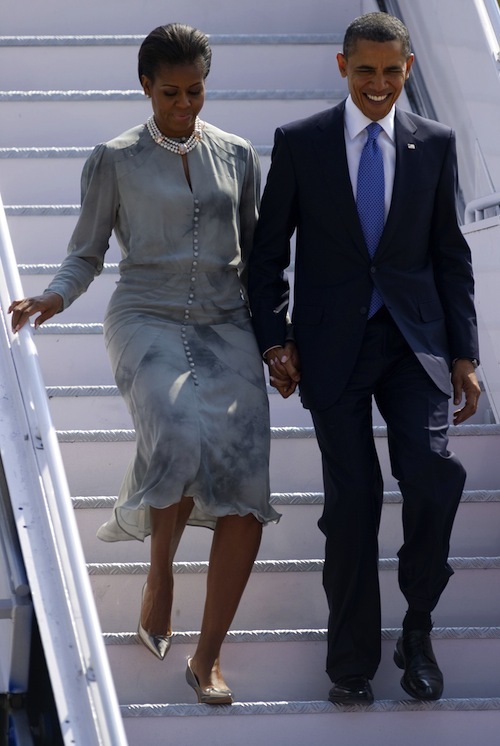 President Barack Obama and First Lady Michelle landed in Mumbai, India yesterday to begin their tour of the country. They began their visit at the 26/11 Memorial at the great Taj Mahal Palace and Tower Hotel. After this, the couple next toured the Mani Bhavan Gandhi Museum. For her grand entrance into India the first lady chose to wear a rather solemn, gray dress. This ensemble is definitely a new look for Michelle. It featured full-length, ruched sleeves and tiny buttons stretching from the top of the dress to the mid thigh. She topped this look off with some metallic flats and a three-strand pearl necklace. Gazing at this ensemble, you may find yourself asking “What on earth was she thinking?” No worries, I too thought this when I first glanced at the dress. However, perhaps Michelle was trying to go for a more somber look to honor the victims of the Mumbai terrorist attacks? Nonetheless, she could have opted for a dress with a better fit. This dress is absolutely nothing less than hideous. The long stretch of buttons down the first lady’s torso only draws attention to her mid-section, making her silhouette appear larger than she actually is. Please stay away from this look! This entry was posted in Faux Pas?, Michelle Obama, Obama Asia Tour. Bookmark the permalink.